I ❤️ Cooking Clubs and Ellie Krieger’s recipes in search of a scentsational side dishes. 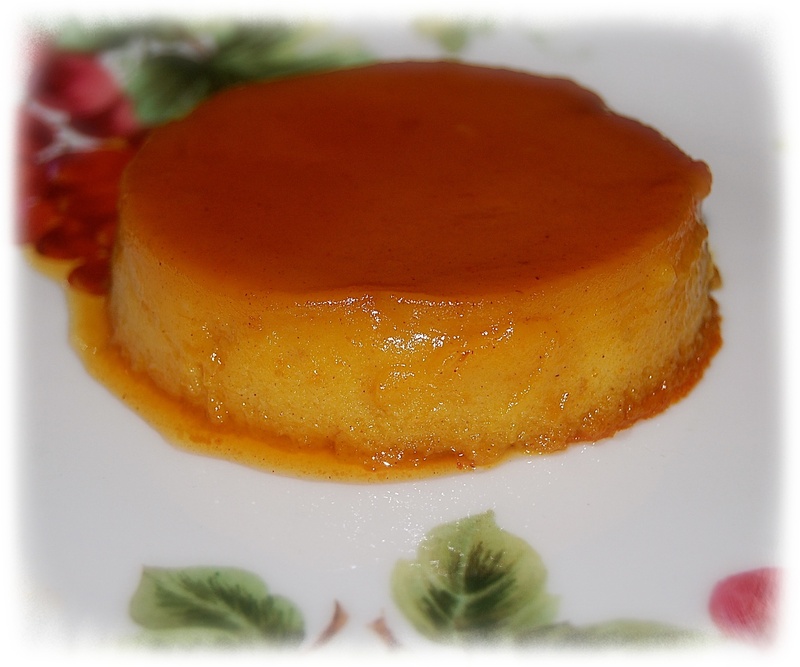 Well, I was in search of not necessarily a sensational side dish for Thanksgiving, but rather seasonal and specifically for pumpkin recipes…Flan would do and makes for a wonderful easy dessert. I must say that I did my best to ruin this recipe as my mind was not on the task at hand, but try as I might, it still came out perfect and very good. I added a splash of real maple syrup to the melting sugar and believe me it did splatter a bit so be careful and step away from the pot until the caramel settles down. I cut the recipe in half and had large ramekins so I ended up making two servings. I totally forgot to heat the milk and evaporated milk before adding the pumpkin etc., but a quick gentle warming before pouring the custard into the ramekins didn’t seem to matter in the end as the flan set up nicely. Arrange 8 (4-ounce) ramekins inside a 9 by 13-inch baking pan. Spray ramekins lightly with cooking spray. In a small saucepan, heat 1/3 cup sugar over medium heat, stirring constantly, until sugar melts and forms a medium-brown caramel, about 7 minutes. Working quickly, transfer 2 teaspoons of the caramel to each of the ramekins, swirling as soon as you spoon in the caramel (it will harden quickly). Set aside. Combine milk and evaporated milk in a small saucepan over medium heat until warm. Reduce heat to a low simmer and keep milk warm. Meanwhile, bring about 4 cups water to a boil and keep hot. Whisk together eggs, egg yolks, remaining 1/3 cup of sugar, vanilla, nutmeg and cinnamon. Fold pumpkin into egg mixture. Then fold into evaporated milk. Divide filling among ramekins, then place baking sheet in oven. Pour hot water into baking pan until it reaches halfway up the sides of the ramekins. Bake for 35 to 40 minutes, or until flan is just set. Let cool. Place a dessert plate on top of each ramekin and invert; flan should slide out, and syrup should flow onto sides of the dish.